These are what our mushrooms look like before we batter and fry them. They come directly to us from the Ostrom's farm in Olympia, Washington. Mushrooms are grown in dark areas. Ostrom's exposes their mushrooms to a special light, however, that allows them to store a healthy dose of Vitamin C.
These cucumbers are freshly harvested from the Skagit Valley soil. They are at the Gielow plant, where they will be washed and then turned into the pickles that go into our tartar sauce. Cucumbers are harvested on a farm in the Skagit Valley, where they have been growing for months. They have added certain nutrients to the soil, and made it naturally more resilient to disease. Now they are ready to be pickles! A farmer checks on her cows in the barn. Darigold farmers own their own land and cows, which keeps family owned farms in our local communities. Darigold standards ensure that all cows are fed high quality food, which makes them happier and healthier when they produce milk daily. The 165' Bountiful returns home to port. This ship does double duty, catching both crab and cod with her crew of 29 in the Bering Sea. Winter on the Bering Sea is prime time to be catching Cod for the Trident fleet. The Trident Company was founded by fishermen in Seattle, and keeps their main office in the heart of Seattle's famous Ballard fishing community. We always source our food as close to home as we can. This allows us to keep our carbon footprint low, and keep quality high. Behind the scenes we recycle all of our used cooking oil, compost all food waste, and take steps to ensure as much of our waste stream is diverted from the landfill as possible. In the future, we will strive to find more ways to reduce waste and keep our food local. All of our cod and halibut is provided by Trident Seafoods. Trident was founded in 1973 by fishermen who wanted to become their own bosses. Instead of relying on large corporations to buy their product and retail it, they decided to go into business for themselves, which provided fair wages for them and less control from buyers. To this day, they maintain that, "Trident fishermen on not dependent on us, we are dependent on them." They catch all of our cod and halibut in an ecologically responsible manner in the rich waters of Alaska, never forgetting that they must protect the resource for generations to come. All of the spuds that are served in our restaurants are grown in Washington and Idaho, specifically Pasco, WA. We serve our fries with the skin on the potato to keep the original great tasting flavor, lightly seasoned with sea salt. Our supplier of fries, J. R. Simplot, is a pioneer in environmentally friendly processing techniques. For example, they are able to take waste trimmings and water from the cutting and cleaning process to generate new electricity to power their plant, and other buildings. Additionally, our fries are naturally gluten free, which makes them a tasty treat for those with special dietary needs. Our oysters come straight to us from the cold, clear waters of Grays Harbor. The oysters are grown over the course of 2-3 years, before they are harvested and shucked by hand. Most of our oysters come from Lytle Seafoods, which was founded in 1983 by Mike and Kathy Lytle. We always looks for smaller and more delicate oysters, which we believe have the best texture and flavor. We then batter them in our original batter mix, originally concocted in 1935 by SPUD founder Jack Alger himself. Then we lightly bread the oysters in our golden breading mix and fry them to perfection. One of our favorite treats, fried mushrooms all start at Ostrom's Farms in Olympia, Washington. Ostrom's has been family owned and operated since 1928. Growing mushrooms is a unique farming process, and requires rich soil. Ostrom's uses all organic materials to create the compost for growing mushrooms. The mushrooms are hand picked daily, and are immediately refrigerated and shipped to stores like ours. In fact, Ostrom's says it takes only two days to take a mushroom from the farm to the restaurant. Mushrooms are grown in the dark, and double in size every 24 hours until they are picked after 9 days. They leave very rich soil behind, which is an organic and sustainable way to fertilize future crops! We use hundreds of gallons of relish every year as the most important ingredient in our tartar sauce. 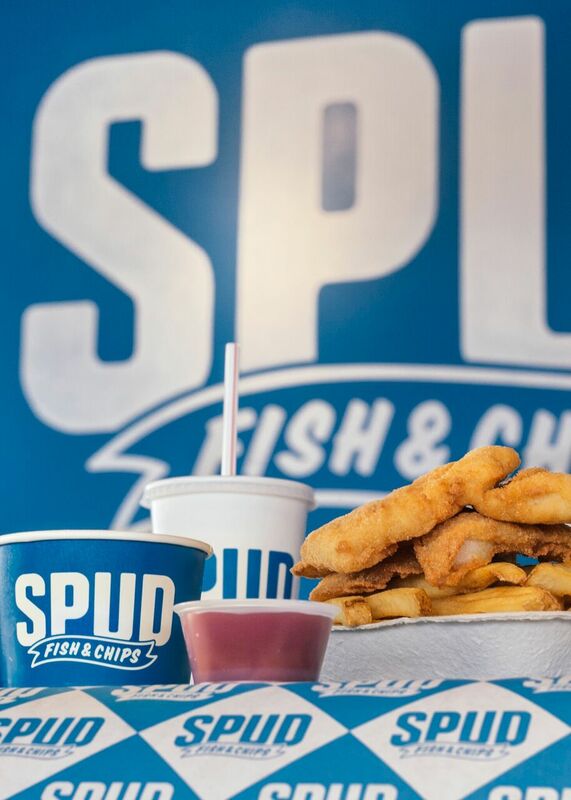 The unique combination of dill and sweet relish gives our tartar sauce its distinct crunch and a flavor that perfectly matches the fish and fries. All of our relish comes from the Gielow Pickles in the Skagit Valley, just north of Seattle. Pickles are an important rotational crop, which is an all natural way to keep fields healthy. Typically cucumbers from these crops are thrown away after being grown, however, resulting in a huge waste of resources. Today, Gielow saves this crop from being wasted, and brings a new revenue stream to support our small, local farmers. Our daily products all come from Darigold. Founded as a cooperative for dairy farmers in 1918, Darigold continues to be owned by the farmers who work every day to bring the freshest product to supermarkets and SPUD alike. Darigold issues a Cooperative Social Responsibility Report yearly, which shows continuous improvement on their part in reducing their environmental footprint, and demonstrates their commitment to supporting their farmers and communities. In our delicious milkshakes and our kitchen, you will find only Darigold dairy goods. We are proud to support our local farmers through our store.